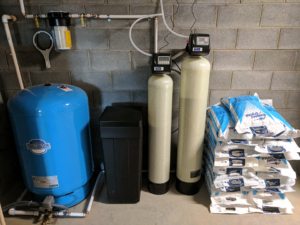 Asheville family having just completed with their new built home they wanted to have their well water tested and treated before moving in. Knowing that some wells can have high levels of minerals, that in the long run could damage pipes and appliances like dishwashers, washing machines, and water heaters. They searched on the computer and googled “water filtration and softeners in the Asheville area.” Mountain Water Systems came up and as the customer said “dominated the front page of a Google search”. They brought their sample bottle of water into our store in North Asheville on Weaverville Rd and after the free test we scheduled a date for the new filtration system to be installed. Before this family moved into their new home, Mountain Water Systems had their filtration system set up.